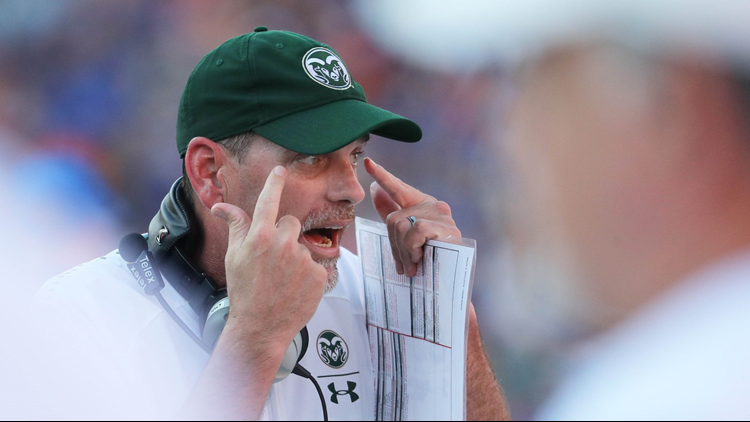 Colorado State Rams head coach Mike Bobo reacts and points to his eyes during the second half against the Florida Gators at Ben Hill Griffin Stadium earlier this season on Sept. 15, 2018. (Photo: Kim Klement-USA TODAY Sports). Here are five quick facts to know before attending the CSU vs. New Mexico football game on Saturday. The Colorado State University football team returns to Canvas Stadium in Fort Collins for its annual Homecoming game at 2 p.m. Saturday. Here are five quick facts to help get up to speed before kickoff. The Rams have a chance to earn back-to-back wins for the first time this season after defeating San Jose State 42-30 on the road last week. CSU (2-4), has a more realistic shot this time around, considering it played Florida at "The Swamp" in Gainesville following its first win over Arkansas earlier this year. Saturday's game against the Lobos should be closer than the 48-10 loss at Florida. The game takes place over Homecoming weekend and is expected to be a sellout. CSU is encouraging fans to allow more time than usual with the larger crowd. Tickets may be purchased online here while availability lasts and more information about Homecoming weekend can be found at homecoming.colostate.edu. The Rams are 49-44-1 all-time in their Homecoming games, and have won four straight (2014-17). A high-scoring game is expected as both CSU and New Mexico have potent offenses that put up big numbers and defenses that surrender just as much. The Lobos have been averaging 459.6 yards and 42.2 points per contest, which will be matched up with a CSU defense that has allowed 469 yards and 38 points on average. CSU's offense averages 409.7 yards and 25.3 points per game, while New Mexico's defense allows 447.2 and 33.2, respectively. The ESPN over/under line is set at 66. Also anticipate a close contest between the Lobos (3-2) and Rams (2-4). As of Wednesday afternoon, New Mexico stands as a 1-point favorite in Saturday's game. That flipped from earlier in the week when CSU opened as the 1-point favorite. Although a win is important to both teams and overall records, it is also crucial in terms of positioning in the Mountain division of the Mountain West Conference. New Mexico is currently tied with Utah State atop the division standings, both with a 1-0 mark in conference play. CSU sits just a half-game back at 1-1 after last week's win and a season-opening loss to Hawaii at home. Despite their disappointing result through non-conference play, the Rams still have a shot to contend within the division if they win Saturday.